Today is SWAN Day (Support Women Artists Now) – today, March 28, 2009 is the second year of this “new international holiday that celebrates women artists.Â It is an annual event taking place on the last Saturday of Womenâ€™s History Month (March).” The executive director, Martha Richards says Â â€œTogether we will build a world where women artists get the respect they deserve!â€ There is a website SWAN Day (http://swanday.org) which lists 160 SWAN Day 2009 events in 11 countries!Â WOW this is quite something to see all these people, women, working together together to make this world a better place for all us women artists! Buying something from your favorite woman artists is a great place to start!Â I am very active and involved in networking and supporting other artists online and at least 90% of the people in the artist teams and groups I am active with are women.Â We are all working and searching for good ways to get our great work out there to YOU in a way that is affordable to you and gives us decent payment for what we have created. At this website, there are some very cool resources.Â Many of them are focused on raising money and publicity for SWAN Day … but they can be useful for us as women artists as we promote ourselves, our artwork and our art businesses.Â We are starting to write press releases for the next AWE Project (Artists Window Exhibit) (Greenfield, Franklin County, MA, US) and I think we will be using these resources to improve what we send out to promote this event that features mostly women artists. I am going to share some of the other resources that were shared with me.Â I am quoting here from an email sent to me by Julie Forbes, Associate Director, SWAN Day.Â Here is a very extended excerpt from her email. Search our well-researched, annotated lists of arts funders, categorized by art form, at www.WomenArts.org/fund/fundlists.html. For answers to many of your funding questions, see our Funding FAQs page at www.womenarts.org/fund/FAQ.htm. These free, bi-monthly newsletters are chock full of current calls for entries from competitions and festivals and requests for proposals from funding organizations. Read recent issues or sign up for free subscriptions at www.WomenArts.org/fund/EmailNewsletterSign-Up.htm. A one-of-a-kind showcase of the diversity and creativity of women artists in all the artistic disciplines, the WomenArts Network is a webspace where woman artists or women-run arts organizations may post free profiles about themselves and their work. With over 1000 profiles of artists living in every state in the U.S. and 23 countries around the world, the WomenArts Network is helping women artists connect to each other and acting as a clearinghouse for those looking to hire a woman artist. Go to www.WomenArts.org and click on WomenArts Network to search the profiles or to get started creating one of your own.Â End of the quote – and there was more … check out these resources and you will find them! I hope you have enjoyed finding out about this, as I have.Â And remember, today is SWAN Day (Support Women Artists Now), but EVERY day is a great day to Support Women Artists! !Â I hope you read this today and also keep this for yourself and woman artists in your life! Thank you for stopping by! Below is the image of the ACEO (Art Cards) book that I bought a space to be in last year.Â A very dedicated art teacher has been creating this book and making a blog to encourage her students to creatre and trade ACEOs/Art Cards.Â You can see my painting as one that is featured on the color of last years book.Â I am very glad I did it – I have a nice 2 page spread with a variety of work – and some text. If you are thinking of joining in (it costs $40), the deadline has been extended to September 11, 2008. I have copied the text from 2 posts on her blog (with permission, of course) so that you can read about it and see if perhaps you would like to join in.Â All proceeds help with the students, books for the students and ACEO education. The Fall 2008 Edition of “Create. Collect. Trade. 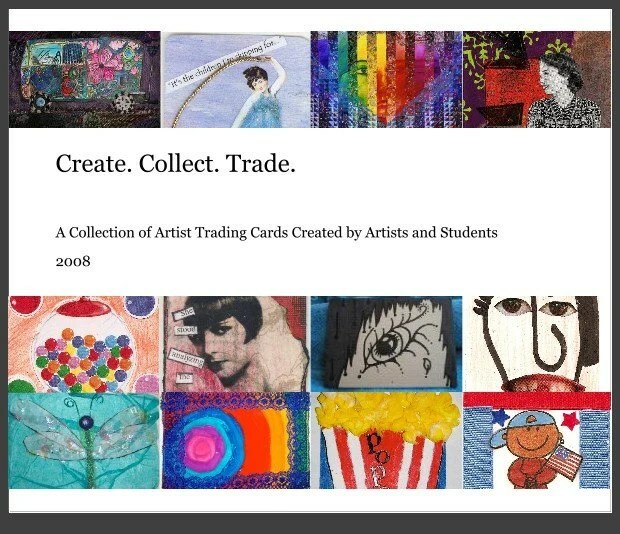 A Collection of Artist Trading Cards Created by Artists and Students,” is in production and accepting ACEO artists at this time to fill 30 available spots. WHAT WILL THE ARTIST RECEIVE? For the $40, each artist will receive 2 FULL PAGES in the book. 4-8 Images from each artist will be placed on the two pages. The artist may write a short paragraph about their art, Etsy shop, experiences, or information they would like to share on their page. Artists may also post links to their shops, website, blogs, etc. for further promotion and information. Upon purchasing, the artist understands that information and images should be appropriate for elementary age students eyes. -Each artist will be recognized on http://createcollecttrade.blogspot.com/ and gain local and national attention through distribution of the book. -The book will also be presented in an 2-hour workshop at the AEAI Art Education Conference in November. -7 Artists will also be selected to appear on the front cover along with 5 students. *Each book includes an actual student ATC to start or add to your collection of ACEOs and ATCs. **Profits from the book and ads go to the purchase of student copies of “Create. Collect. Trade.” I have been writing many grants to help provide copies, but I can only do so much! If you are not sure if this is something you are interested, feel free to check out the first book (currently on back order, but will be available in 2 weeks). last minute artists want to join! Contact me at createcollecttrade@yahoo.com if you are interested! I hope you have enjoyed reading about this and seeing last year’s book.Â This is the only time that I have ever paid to be in something – but the proceeds are for books for the students. (You can also donate directly to books for the students on the blog).Â I am thrilled that I am in there … perhaps I will even do it again! Technorati Tags: ACEO, Art Cards, Create. Collect. Trade. We made some real progress on the AWE Project (Artists Window Exhibit) today. People took on some tasks and it very exciting!! We decided to work to share our windows with children paintings from school for the next time. Here is an image from a previous project. I am exhausted and tomorrow is my hospital day – so hopefully I will have more energy! Each month Worldwide Women Artists Online (WWAO) have an exhibit (online of course) of membersâ€™ work based on a theme. This month is Beautiful Mother Earth. I encourage you to go on over and look at this great exhibit! I am sure regular readers have already identified my painting. Besides being in the online exhibit, this is also listed as a ACEO in my Etsy Shop. Here is my Etsy Shop.If you would prefer this in a different size, let me know and I will do one up for you!! 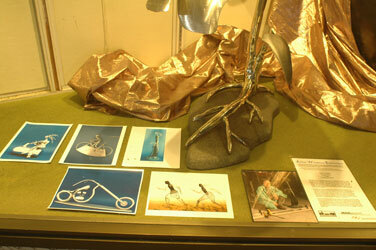 Each of the paintings or items in the show can be purchased. Thank you for looking at my being showcased!! This ends the interruption in our regular programming … tomorrow will be a Fanciful Animal Image and hopefully by Thursday I will have figured out how to do Homage in bubbles! Thank you to everyone who stopped by and looked and commented – even though I didn’t write. I did not feel well enough to do anything but share an image and it means a lot to me that you came anyway!! Thank you! I am pretty excited because I got news of the results of my grant application to the Local Cultural Council. Some of you will remember I applied back in October 2007. I got the notification letter and was awarded the full amount I asked for. I have never even applied for a grant before so I am very delighted! This grant is to coordinate the AWE (Artists Window Exhibits) Project in downtown Greenfield, Franklin County, western Massachusetts, US. I don’t just get the money … I have to do the work and then submit invoices for the particularly parts of the work. One of the big things I will need to do is make a database of all the potential places to exhibit our work (mainly store windows), contact information and any specific details. To do this, I will have to learn a new program to make it easily accessible to others. With this database in other years someone else could more easily take over. I am now off to the board meeting of the local group, currently Create Franklin County, which works to stimulate the local creative economy, the economy that includes artists, web designers, and lots of small home-based businesses. I think it also includes building the green economy – or at least they are in conjunction with each other. Tonight is a big step for the town. We have joined ICLEI. ICLEI is an international membership association of local governments working to reduce greenhouse gas emissions. They provide programs, tools, software assistance and technical expertise towards this goal. To find out more about ICLEI and its programs go to www.iclei.org. The is for local towns and cities working to deal with climate change. Much of this paragraph is taken word for word from the promotional materials. This is sponsored by the Greening Greenfield group that I belong to and am active with. These are 2 important meetings to go to today … and I am still only at half steam. (This is an expression that means I still do not feel very well). Thank you for coming and reading!! I will catch up your blogs soon.